So far, the frightening MERS virus has infected three people in the United States — two who carried it from Saudi Arabia, and a third who became infected by one of the travelers. Public health experts noted immediately it’s another example of how any disease is just a plane ride away. The biggest and best example is West Nile virus. It was never seen in the Western Hemisphere before 1999. A few cases showed up in Queens, and then the virus, carried by mosquitoes, quickly spread across the whole country. It killed 119 people last year and made 2,469 people sick, and it’s now here to stay. There are two flavors here — H5N1 and H7N9. H5N1 first showed up in 1998, and started circulating in earnest in 2003. It kills off flocks of chickens, but can quietly circulate in ducks, so it’s hard to control. It’s infected 665 people in 15 countries, killing 392 of them. So far, H5N1 remains hard to catch and people rarely infect other people — most cases have had contact with birds of some sort. The H7N9 virus only showed up a year ago in China, but it’s infected more than 440 people and killed more than 122 of them, with four new cases reported this week. Influenza scares health experts more than any other virus, because it can spread so easily from person to person and has a high death rate when a new strain starts spreading. Flu viruses are very prone to mutation and experts say any of the various bird flus could evolve into a strain that infects people easily, causing a pandemic that could kill millions of people. Measles is easily prevented with vaccination, but poverty, disasters and a recent move to question vaccine safety in rich countries had led to pockets of outbreaks around the world and in the United States. Although many people view measles as a fairly harmless childhood infection, it once infected 3 to 4 million a year in the U.S., killing up to 500 and permanently disabling 1,000 every year. It is one of the most infectious viruses out there. A single person can infect between 12 and 18 others with casual contact such as sitting next to them. An ongoing measles outbreak in the Philippines has sickened more than 20,000 people and killed at least 50, and at least 129 measles cases from 13 states have been reported in the U.S. in 2014 so far. “We focus on two aspects of infectious agents when assessing the magnitude of threat to public health. One is pathogenicity — whether infection results in serious illness or death. The other, transmissibility, reflects the likelihood that exposure will result in infection,” said Dr. Ian Lipkin, an infectious disease specialist at Columbia University. TB is one of the oldest scourges known to humankind and it spreads very easily, settling in the lungs but sometimes in the brain or spine. The bacteria that cause TB can float in the air for hours, making it very hard to trace the source of infection and making it very hard to avoid. TB is usually easy to treat with antibiotics, but drug-resistant forms have emerged that resist most of the mainline drugs and that can take months or even years to get rid of. The World Health Organization projects that two million people will get infected with multiple drug resistant TB (MDR-TB) in 2015. In 2007, Atlanta lawyer Andrew Speaker made headlines when he sneaked back to the United States after flying abroad after he had been diagnosed with MDR-TB and traveled anyway against CDC orders. He was arrested and forcibly isolated and treated. “Many of us in the field of infectious diseases are concerned about dengue virus, an agent spread by mosquitoes,” says Lipkin. Dengue has been seen in Texas and Florida, killing a Texas woman last October. Dengue is the world's fastest-spreading tropical disease and WHO says it represents a pandemic threat. It can cause a hemorrhagic fever — a fairly horrific set of symptoms that include bleeding under and on the surface of the skin. The good news is that only about 20 percent of people infected with dengue show any serious symptoms at all. Chikungunya has been spreading out of Africa into the Indian Ocean region, Asia and Europe in recent years. So far, more than 100 travelers have carried it into the U.S. but it hasn’t spread. But it’s getting settled into the Caribbean. 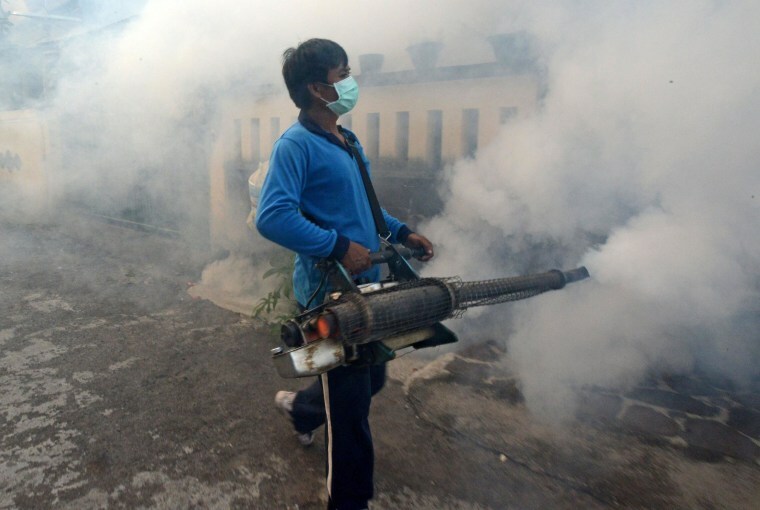 The Pan American Health Organization reports more than 55,000 cases since December on several Caribbean islands. It’s carried by the same mosquitoes that carry dengue and West Nile, and officials worry that warming weather will bring it to the U.S. It’s not especially deadly but it’s very painful and up to 90 percent of infected people feel sick. This is one of the scariest viruses out there, killing up to 90 percent of victims, depending on the strain. It’s also a hemorraghic fever, causing internal bleeding, and patients die of shock. An ongoing outbreak in Guinea, in West Africa, has sickened 248 people and killed 171 of them and five people are dead in Sierra Leone. The good news is that it makes people so sick, they are unlikely to travel and spread it. “There are diseases like Ebola, where mortality is high but the risk of infection is low unless one comes into direct contact with an infected person or an object such as clothing that has been contaminated with their body fluids,” says Lipkin.